It’s December 27th and Christmas is over. I celebrated it with my husband and two daughters and it was a lovely day. A blessed day. But sometimes I wish it was a different sort of day. Maybe that’s because in my “mom role” I am, ipso de facto, the one in charge of food. I am the one who plans, buys and prepares breakfast and dinner. I enjoy doing it. I do. But sometimes, sometimes, I want to have someone else doing it too. 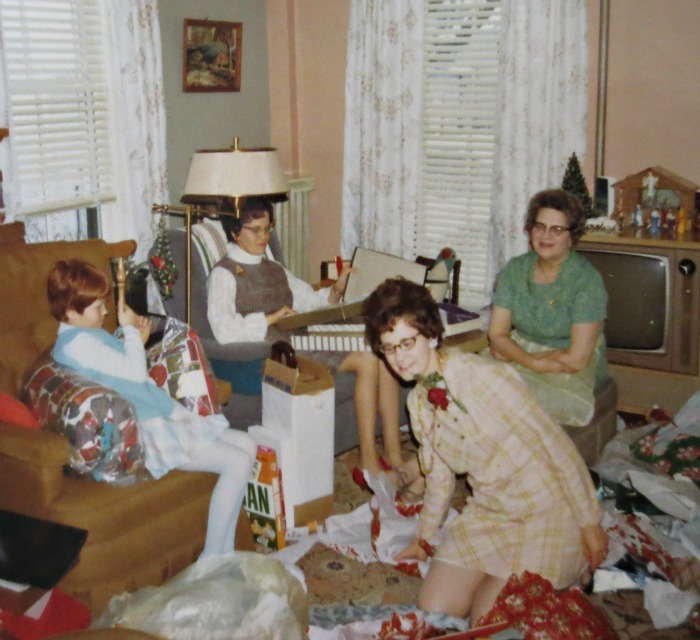 Opening presents Christmas 1969 with my mom, gram and aunt. They are all gone now. Sometimes I miss those days. But fast forwarding to the present, I wonder why I don’t ask for help in the kitchen on Christmas day. I know everyone would be glad to help. Maybe it’s because I’m trying to be my mom, aunt and gram all rolled into one. Maybe it’s because I want everyone else to relax and enjoy the day. Maybe it’s because if I keep busy, I won’t have time to get sad. But it never works. This time of year shines a spotlight on loss. While I strive to keep in the moment and am generally happy, I can’t help but think about past Christmases and all the people who are now gone…my mom, gram, aunt and two uncles. And next Christmas??? I think I’ll ask for help in the kitchen and start some new traditions! yes, how true! Losses show up—-and your right about the treatment.